In reply to a question about how he would pay for one of his proposals, Senator Sanders said, “We have suggested a trillion-dollar investment. Now, you know how we’re gonna pay for that? I’ll tell you how we’re gonna pay for that. “Right now, this country is losing $100 billion every single year because profitable corporations are stashing their profits in the Cayman Islands, Bermuda and in other tax havens, and in some cases, not paying five cents in federal income tax. Senator Sanders’ comment last night was very similar to a comment he made about Bermuda in a debate last month. Former New York City Mayor and regular Bermuda visitor Michael Bloomberg — who had been considering running for President — announced today that he will not enter the race, saying that it is clear he cannot win. 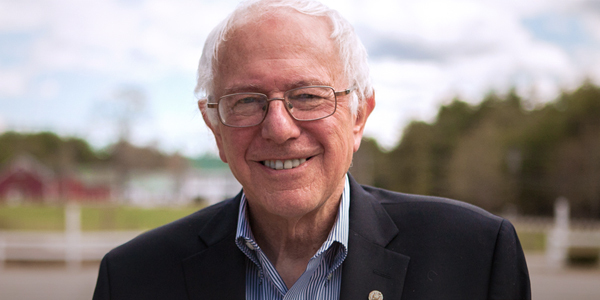 Bernie for President…THATS MY BOY ! And Trump wants to build a wall !!!!!!!!!!!!!!!!!!!!!!!!!!!!!!!!!!! I laugh when people call Trump bad, while turning around and saying that people who’ve lived here for 15 years legally shouldn’t have the right to apply for residency. Trump’s views would be far too lenient for those types. Just like John Kerry,the Clinton’s its all wop, wop, wop, fool the folks in middle America were most have no idea where Bermuda is. They all hide their money here and Switzerland. They don`t want them to know , let alone how much cash they make and hide. Seem they have You fool too! It’s what Hillary says and would do as President that really matters. She will be the Democrat contender. In ten years all these tax heaven payers will be gone as well as those waiting to get Bermuda status, since Bermuda dollar will collapse. Exactly and then we will become like all the other islands. Jamaica, barbados, Bahamas.. good tourism.. but $#^+ economy and a lot of violence. But we’re already halfway there anyway.. Living on a prayer indeed. The same type of investment that Mr. Bernie Sanders wants to make in America’s infra structure, we need to make in our people. There is no reason why Bob could not make a “Fund” that would operate inside Bermuda, and make the money flow easier. Let’s appeal to IB for this type of assistance , and by pass the banks altogether. As it stands, we are holding tons of money in our banks, but it’s not working for the average Bermudian. So I take it that you cant influence ya party, or they only listen to a certain segment. YOU”VE GOT IT. NEED I SAY ANY MORE!!!!!!!!!!!!!!!!!!!!!!!!!!!!!!!!!!!!!!!!!!!!!!!!!!!!!!!!!!!!!!!!! Yeah, shame, the PLP could have done that, but they didn’t want to look after Bermudians. Well, well Rodney , has the reverse mortgage been a success, how many of the working population we have to support a scheme like this ? Don`t take rocket science to see what happened in Russia, China is a mess. Obama gave the tax payers money back to the same crooks in the Banks, and the housing developers instead of to the Fred`s and Fannie-maie`s who lost their houses. Sanders, Clinton nix, all living off the public trough. I wonder why leftists always think that the money somebody else earns should be given to those that did not earn and in most cases don’t even want to get up in the morning to go out to earn a living. Sanders is a Jew. Why has he not told ANYONE this so far? Why is he hiding the fact he is Jewish? If it should not matter he should have said it ages ago, but he didn’t. Can’t trust people like that. anti Semite eh, so Racist ugg. United States of America is a company, not a country. It is owned by the Federal Reserve bankers who bought America outright in 1933. Americans do not have money or currency, and the bills everyone uses are PRIVATE PROPERTY OF THE reserve bankers, who by the way are all Jewish and co-owners of the World Central Banks. America’s debt will never be paid off, and it will be used as an excuse to “enslave” financially all Americans. Will that happen here too? PLP made a good start. America spends $15,000,000,000 per black-project aircraft such as stealth bombers. They build fleets of them. And we are supposed to believe that the money some americans legally “hide” in bermuda is such a big bad no-no? Trashing Bermuda, the Bahamas and Switzerland all in the name of bringing these funds back onshore in the USA – hypocrites!!! The money is in Bermuda, and is not being used to benefit us. We all clap for corporate welfare, but cry holy hell if we feed and care for a homeless person .This is what people are upset about. Does the OBA hear the people of Bermuda? Does the OBA realize that people are ready to put the PLP back in power. WHY? BECAUSE WE ARE NOT LISTENING. That Head vs. Heart talk touched a cord. The people are asking do we feel their Pain, and all we are saying , “IT’s IN THE NUMBERS.” People don’t want to hear that. They want to know what are we doing to help them. We don’t have an answer yet.